Two new comedies mark this weekend’s releases, a sequel and a remake. Looking at both of them though, I’d rather just stay at home this weekend, if they were my only choice. 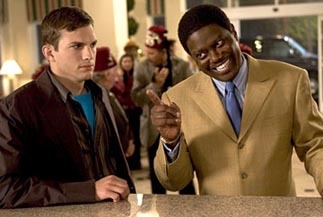 The remake is Guess Who, starring Ashton Kutcher and Bernie Mac, though really “remake” should only be used in the loosest of terms. It borrows about a third of the title from Guess Who’s Coming to Dinner, and flips the races around, with Kutcher playing the “interloper” boyfriend. However, this version plays for straight comedy, where the 1968 version imagined itself as an important message movie. It is, however, hopelessly dated now, and perhaps ripe for a remake opportunity. I say “a”, not “this”, as this is essentially Meet the Parents with a hip-teen edge (Did the sarcasm come through there? I’m never really sure). Kutcher had his dramatic “breakthrough” last year with The Butterfly Effect, which opened to $17 million, but his future remains in comedy or as “Mr. Demi Moore”. His Just Married defied any and all expectations by opening to $17 million in 2003, though My Boss’s Daughter was a huge miss. Bernie Mac hasn’t been that successful on his own, other than the Ocean’s Eleven movies, and his Mr. 3000 had about 3000 paying customers. The Meet the Parents formula should work pretty well here, and going more slapstick probably helps. Looks for Guess Who to bring in about $24 million this weekend. Miss Congeniality 2: Armed and Fabulous, seems to recognize its own futility in its premise; after receiving national attention for her efforts in the first film, Sandra Bullock’s FBI character is virtually useless to them as a field agent. Although she’s the “public face” of the FBI, she has completely reverted to her state at the start of the first film, and they still see fit to send her on missions. When a movie admits right off the bat that it’s ridiculous, you know you’re witnessing a naked cash grab. There seems to be virtually nothing remarkable about this film, except for Sandra Bullock performing her goofy shtick. For those that like that kind of thing, this movie is for you. For virtually everyone else, it’s something to avoid like the plague. This should pan out about the same as Legally Blonde 2, which made slightly more than its original in its first weekend, and then quickly disappeared from theatres. I predict $16 million for Miss Congeniality 2, which has gone the highly unusual route of opening on a Thursday, something I can’t remember happening outside of Christmas holidays. On the surface, a $35 million opening for The Ring Two is easy to sell as a positive start. However, a 50% increase for a horror sequel that virtually doubled its screen count and failed to inspire much, if any, positive feedback, spells trouble for this potential franchise. The biggest criticism of the film: it’s just not scary. The Ring Two should see a massive drop this weekend, likely over 50%, to around $15 million. Robots had a disturbingly high decline for an animated film, dropping just over 40% to earn $21 million in its second weekend. Like last fall’s Shark Tale, it is not proving to have the same automatic appreciation that other computer animated films are, though it is by no means a bomb. It should earn about $12-13 million this weekend, and will eventually cross the $100 million mark. The Pacifier continues to play strong, earning another $12.5 million last weekend, and has brought its total box office to $76 million total. It too should cross the $100 million mark in the next few weeks, which would be Vin Diesel's third film to hit the century mark. Ice Princess is Disney’s other film in the marketplace (after The Pacifier), but the $7 million opening is unlikely to translate into much more. Likely a cheap film to make, this should be a success on video for the Mouse House after earning about $30 million domestically. It’s a quiet week in general at the box office, with the two uninspiring openers and not too many films in limited release of note. On the other hand, there’s D.E.B.S., a film that looks to do for teenage spy films what Undercover Brother did for blacksploitation films. It opens in 46 theaters this weekend, and might just be a favour to director Angela Robinson, who has Herbie: Fully Loaded out this summer. However, any film that features Jordana Brewster as a megalomaniacal lesbian evil-doer can’t be all bad.